Researchers and Staff at IREC extend knowledge and information through our Annual Field Day, various grower meetings, tours, and local school-sponsored events.  Call us to schedule your meeting or tour at 530/667-5117. 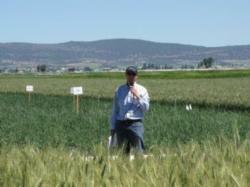 The Annual Field Day is an opportunity to share with the community the wide range of research conducted at the Center. The highlight of the day is a guided tour of Center research projects accompanied by UCCE advisor and UC researcher presentations. Researchers, growers and industry personnel gather together to share information and experiences, and to build camaraderie. Increasing crop yields and managing pests are crucial to the well-being and sustainability of California’s economy and ecology. Area growers and industry personnel can learn about new management practices and integrated pest management on UCCE-led Field Tours. The Tulelake Onion Growers Field Tour focused on control of weeds, onion & seed corn maggot and thrips. Growers can use this new information to make informed decisions in their farming operations. 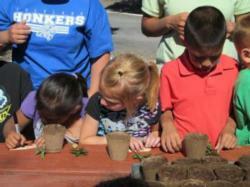 The joy and importance of growing food is imparted to children via the Children’s Tours. Each summer, UCCE staff educate busloads of area children about the importance of agriculture in their daily lives. After walking and digging through potato and onion fields, the children receive planting seeds and mint cuttings, learning how to care for plants in their home gardens. School tours often end with a special treat of homemade mint-chip ice cream, made with mint oil distilled at the Center.